The long wait is over with the release of the Cameron’s Playhouse sequel on DVD and Blue Ray. Film Director, writer and producer Cameron Hons has spent nearly 2 years organising the return of the next chapter in the film series. The story is about video piracy and how the original work of a film producer is stolen and used for financial gain. The multi-talented Hons is excited the project is now available, and the tireless work of the cast and crew can now be enjoyed by global audiences. Hons said majestic backgrounds were carefully selected around Australia like Sydney, the Gold Coast and the nation’s capital Canberra. “Some scenes were shot in different international locations like Tianjing China, places around Japan, New York and near the Brooklyn Bridge,” he said. 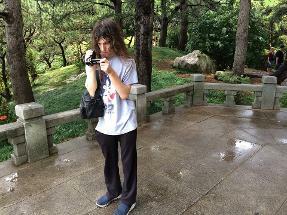 The cinematography was breathtaking with opening scenes in Japan and other countries filmed by cast member overseas. The success of the film can be attributed to teamwork and the maintenance of a small budget to keep down production costs. Hons said the friendship of the cast and crew working behind the scenes was often stretched causing the production schedules to be off track for up to 5 months, throughout the filming of the movie. The audience are introduced to the leading actors as the story unfolds, including Dr Jefferson played by the multi-skilled Cameron Hons. Meeting him on screen was like watching Dr Jeckyl and Mr Hyde make a guest appearance on the set of the Young Ones. His character brings a mix of comedy and tragedy in the one take, encouraging viewers to demand more. If a spin-off sequel is not on the cards for this character, it should be! The soundtrack was beautifully matched with the mood of the film bringing the emotions of the characters to the audience. The opening sequence introduces us to Cameron the character in the film, who has become the victim of video piracy and copyright violations. The suspense in the movie is intensified with a background music that leaves the audience with a sense of wonder. "We have faced many filming delays and cast fallouts as well as arguments over time schedules and creative differences. Sometimes people would just disappear for months and come back,” said Hons. One cast member returned to the project after 12 months and offered to help film additional scenes, as he was moving to Tasmania, and wanted to help finish the project before he left the NSW. One scene showed the transaction of illegal DVDs set in a suburban walkway. It showed a dramatic performance that enticed the audience into the situation, making them feel like they were part of the equation. Some camera angles captured the moment that felt 3D-like. You could almost smell the cigarette smoke! Hons said the original movie had a dark premise and was going to be about doomsday prepping. There was going to be a very jealous man in the film in early stages called Walder Heathcote. The Australian bushfire is iconic around the world and real scenes of smoke were filmed in suburbia, to help local and global audiences make that connection with the bush landscape. Dramatic scenes of traffic chaos were filmed in real-time to treat viewers to the sense of panic as the piracy issues became a reality. “We quickly dropped these dark ideas when we started filming as the cast came up with their own funny characters for side stories. I like collecting live audio bootleg recordings of my favourite bands for historic purposes and enjoyment, I don't sell them, but on one bootleg site, I had a really bad experience of betrayal by a website,” he said. One scene can be aptly named the ‘scream scene’ whereby a retro CD shop had one man sound like he was doing an impression of Bobcat Goldthwaite from Police Academy and Vivian from the Young Ones, who sounded like he accidentally got his hand in an revolving door. It has been confirmed that this is the last in the Cameron’s Playhouse series and that a trilogy is not on the cards for either the cast or crew. Amongst the turbulent ‘ups and downs’ of filmmaking, Cameron Hons has some advice for future producers keen to stick their ideas into the creative melting pot. With no spoilers, the ending of the film will have you wondering what the future will bring for filmmakers and musicians in the future. On screen cast members include Cameron Hons, Chris Peers, Sam Berrigan, Theo Schrock, Stefan Goslinga, Tim Duffy, Jonathan Spencer and Bernie Sharah. The film is rated M.
You can also purchase your DVD from this link too. 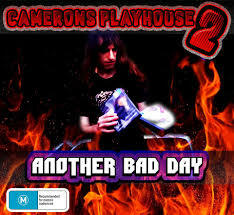 For more information regarding the film Cameron’s Playhouse 2, contact Cameron Hons via email on: sonicrox22@gmail.com. 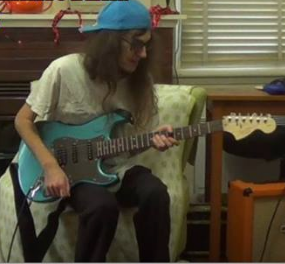 Musician Cameron Hons creates the music for the film.